Last year saw unlimited data plans become the norm, and, courtesy of the OpenSignal's communal methodology, we now have a snapshot of their impact in terms of LTE speed, availability and 3G fallback, for the big four US networks during the whole of 2017. As you can see in the chart above, there were some notable hiccups when unlimited plans took over, especially at Verizon, as the largest carrier with the most subscribers to weigh on its network. After it followed in T-Mobile's footsteps, and introduced unlimited plans, the average data consumption immediately increased twofold. That put an enormous strain on the network, and Q2 saw a big dip in overall LTE speed and availability. T-Mobile, in contrast, was early in the unlimited game, came prepared, and has much less users to put a dent on its towers, so its overall speed has been simply rising steadily, as it pours more resources into its network. Verizon, however, reversed the dip fairly quickly, and ended up Q4 with actually faster overall LTE speeds than it started the year with - a commendable achievement given the scale and costs involved. 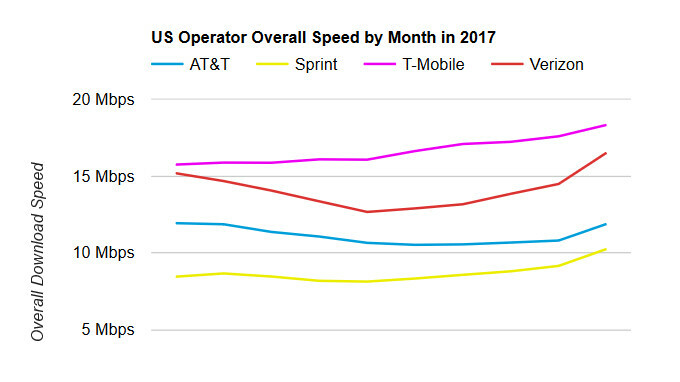 While lower on average speeds, AT&T muddled through its own unlimited offer introduction, and remained largely unscathed throughout the year, thanks in most part to the fact that its network turned out pretty reliable in terms of establishing connections, so slow and steady won the race at the nation's second largest carrier. Sprint ended up with an overall LTE speed increase, largely unaffected by the unlimited rush. Bear in mind that OpenSignal's data is crowdsourced, and users are mainly hailing from well-serviced areas, where T-Mobile has good signal for the most part. Verizon and AT&T still take the cake when it comes to coverage, especially in more rural areas, but when it comes to speed and latency, T-Mobile seems to deal with its workload better. All in all, now that Verizon has recovered from its LTE speed dip, and its unlimited data plans have all but evened in price with the smaller carriers, it seems to have a rosy future ahead. If Sprint's merger with T-Mobile goes ahead as planned, though, all strategies might have to be rewritten yet again, despite Verizon's "we don't care" claims. That's not their goal. They just assume you would use their pre-paid as opposed to post-paid if you have financial challenges.